How accurate should rotating equipment be aligned? This depends very much on the type of equipment and the speed it is running with. In general rotating equipment has to be aligned within ±0,05mm for the parallel offset and within 0,05 mm over the full coupling diameter. It is very important that accuracy is not mixed up with the target alignment. For example: A diesel engine will grow parallel 0,2 mm over a generator during operation. The target alignment should then be -0,2 mm ± 0,05mm. The coupling manufacturer indicates that his coupling can take more than 2 mm misalignment. What does this mean for the accuracy of the alignment? Nearly nothing!! First of all it depends very much on the type of coupling which is used. Some couplings can take parallel offset easier then angular offsets or vice versa. A coupling in general is designed to transmit power and to allow for misaligned during start up. Most couplings are designed to "absorb" loads due to misalignment but still there will be forces going into the machinery and these will cause damages to seals, bearings and other parts. Over which distance can we align rotating equipment? For a 0,05mm precision, we can measure up to 15 meters distance. Is a Shaft system able to measure soft foot? Yes, all our Shaft systems have a software program to measure soft foot. Do you always have to use a laser alignment system? In most cases a laser alignment system can be used for performing an accurate and fast alignment. However we must not forget that a laser alignment system is a tool and not a magic box. An alignment engineer still has to use his brains and creativeness in order to solve alignment problems. We choose the tool for each specific problem and situation and sometimes we go back to use dial indicators. Sometimes, from a practical point of view, there is no possibility to use a laser alignment system. Will a laser alignment system be able to measure if we only can rotate the shafts over an angle smaller than 180 degree? It is always the most accurate to rotate the laser alignment system over 180 degrees. However, in some situation this is physically impossible. 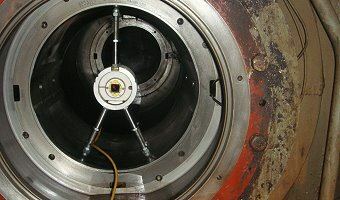 Modern systems like our shaft systems are able to measure over an angle of at least 60 degrees. Do we need to align cardan-shafts? The traditional cardan shafts (without hemokinetic device) need to be aligned with a zero angle. An angular error results in a non linear movement which causes vibrations and extreme forces in mainly bearings, couplings and seals. How accurate is measuring with a geometric laser system? External Influences like temperature, moving air, dust, vibrations and distances can and will negatively influence the accuracy. Very important is always that the alignment engineer gives his opinion on how much the measurement is influenced by these external influences. What is the difference between a geometric laser system and a traditional optical instrument like a theodolite? Although SKF Solution Factory - Marine Services is recognised as the laser alignment specialist we also sometimes use the latest 3D theodolites. What kind of measurements can be done with a geometric laser system? Typical measurements are: straightness, flatness, perpendicularity, parallelity and line bore. What kind of measurements cannot be done with a geometric laser system? They are only able to measure 2D, alternatively we can use a 3D theodolite. What about geometric laser systems when the machine is in operation? This depends very much on the application but we are able to measure thermal growth when for example a machine train is operation but we have our difficulties measuring the parallelity of rolls when the paper mill is producing. Over what distances is it possible to measure with a geometric laser system? In general it starts with a few centimetres and it ends around 100 meters. It also depends on the measurement procedure which is followed. What types of measurement instruments does SKF Solution Factory - Marine Services use when doing 3D measurements? We have both Sokkia MONMOS Total Stations and Faro Laser Trackers with which we do all 3D measurements.